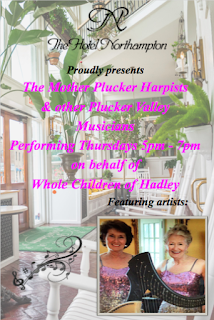 Local harpists including Rosemary Caine and her fellow colleagues play every Thursday in the Hotel Northampton Atrium (lobby) from 5:00pm to 7:00pm. The artists play for the benefit of Whole Children, a local organization that works for children with disabilities. The hotel series features a great roster of some of the Valley's best harpists.